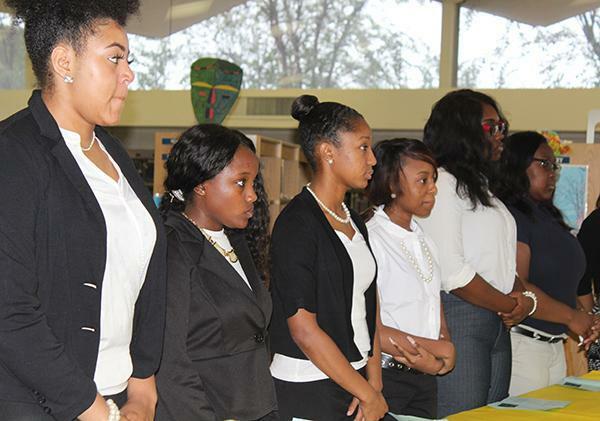 On October 16, in a brief ceremony, the Natchez-Adams School District’s Chapter of Mu Alpha Theta, the National Math Honor Society, inducted 11 students into its ranks. Mu Alpha Theta is a national high school and two-year college mathematics honor society whose membership annually includes nearly 100,000 students at more than 2,000 schools across the country. Mu Alpha Theta recognizes and encourages students who enjoy and excel in mathematics. The induction ceremony, held in the Natchez High School Library, included a series of 2-minute math history presentations by Mu Alpha Theta sponsors Lillie Sweazy, Kimula Turner, Dr. Cheryl Conway, and Stephen Collins. After the conferring of certificates, Sgt. Wilbert Washington, JROTC Instructor, offered his congratulations to the new. He encouraged each inductee to be proud and show off their achievements around the school. He asked them to encourage their classmates, especially young men to take education more seriously. Perry Revels, Natchez High School Assistant Principal congratulated the students on their excellence in math and reminded them of Principal Eric Jackson’s motto, Determined to Rise, Destined to Succeed”. Following the ceremony, the inductees and their families were treated to refreshments. Congratulations to D’Ashia Bernard, Desnick Bolden, Da’Nasia Caston, Kaitlyn Green, DeAsia Holmes, Cordni McDonald, Takeria Owens, Tierra Robinson, Kaitlyn Seals, Carleigh Sproulls, and Iyonika Washington on their new honor!